Nvidia Tegra zone application is now live on android market. 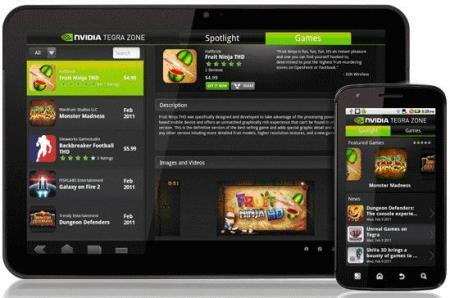 Tegra Zone is a game store like application that delivers Tegra optimized games to end users. The app also features game reviews, screenshots, trailers, gameplay videos and behind-the-scenes shots. While this might open up a new kind of fragmentation, it is one way to make sure that the game that you purchased for your Tegra device will run without any lag or problems. Samsung is coming up with it’s own game hub and Sony Ericsson has announced it’s own Playstation suite for android. Do note that the applications available in tegra zone may not run on non-tegra hardware so do make sure that your phone has tegra powered CPU/GPU before purchasing a game inside Tegra Zone. “Tegra Zone is great for the mobile ecosystem. It’s enabling new, optimized software and providing opportunities for developers to create premium content for Android devices.”- Ben Barjarin, Principal at Creative Strategies Inc.